It is less than a week until one of my favorite holidays, National Root Beer Float Day on August 6th. It is a day to recall my fond memories of sipping ice cold floats at drive-in restaurants we loved to frequent. That great part of Americana is mostly gone. But we keep the tradition going by whipping up sparkling floats at home with a new twist. We were in New York City for the opening party of a young artist we know. The gallery was blazing hot and not just from the warm weather we were having. The advant-garde art and the surging attendance of beautiful young people was fascinating but the heat and hunger lead us to seek out a cool place to eat. We wandered down Eighth Avenue in Chelsea all the way to 19th Street and found nothing that really caught our eye. That strip was once a mecca of great restaurants but has gotten very tired. We decided to head west and try Ninth Avenue. As you know on Ninth Avenue you can find almost any cuisine with many great restaurants on every block north of 42nd Street up into the 50's. But many great restaurants are now also opening on the lower parts of Ninth. We were very pleased to find this very appealing new Vietnamese restaurant on the North West corner of 19th and 9th. It is called Co Ba. Peter Mayle has a great new book for those who love to learn about wine. The "A Year in Provence" author is back and engages you in an intriging tale of wine and whoodunit. Great summer read. We just can't wait for the Mad Men Season Premier tomorrow. It is going to be a great season worthy of many toasts. Here is our cocktail line up for tomorrow. Here is a perfect response to our times. Looking to save some money, yet have some fun? Want to cut back a little on your alcohol and calorie consumption? Still want to make a splash at your next party? Mini Martinis are your answer. We love going into NY on summer weekends when the streets are empty and the restaurants and bars are not crowded. So an afternoon jaunt to NYC on the 4th of July was an easy choice. We were on our way to the Sunshine Cinema on Houston near the Bowery to see Love Ranch. Which by the way was a very enjoyable movie. We spotted this great bar and restaurant called Macondo with its doors wide open and took a seat at the street side bar for some delicious food and drink. 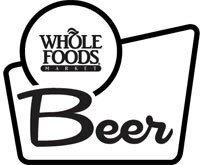 This has got to be an undisputed mecca for beer lovers, Whole Foods Bowery Beer Room on Houston Street between 1st and the Bowery. I was back again this past weekend. I really have to get to this place more often. Picked up a few new brews. Offering over 400 bottled brews from all over the world and 6 draft beers that are sold in freshly filled "Growlers." Here are three interesting white wine varieties that are worth trying when you have gotten bored of those common white wines. Soave form Northern Italy, Pinot Blanc from Italy, France, Washington State and elsewhere and Viognier from California, Australia etc. They each have distinct characteristics and are great food pairing wines. They are all immensely popular with those who have explored them.